Bodice There are 7 products. 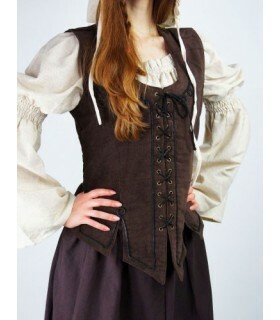 Elegant dark brown medieval bodice edged and laced. Manufactured 100% cotton. Machine wash 30ºC. 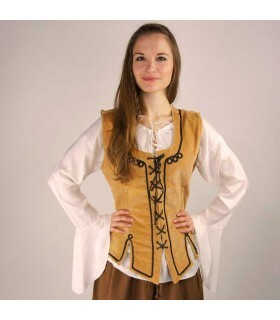 Elegant medieval bodice with ribbed and laced mustard. Manufactured 100% cotton. Machine wash 30ºC. Medieval black corset with wide straps and elastic band. It has ties in front, elastics at the back and integrated lace. Made the blouse in 100% viscose and lazs 100% polyester. Machine wash 30ºC. Corset model Margot cream color. Made of 100% cotton and should be washed dry. Corset model Margot red-black. Made of 100% cotton and should be washed dry. Corset medieval model Margarette available in red or black color. Made of 100% cotton and should be washed dry.